Image: Makeup By Mary B. The "Going Green" Tag was started off by Rachel from All Natural Aspirations and I've been seeing it everywhere recently, so I had to get in on the action when Mary from Makeup By Mary B. tagged me to take part! 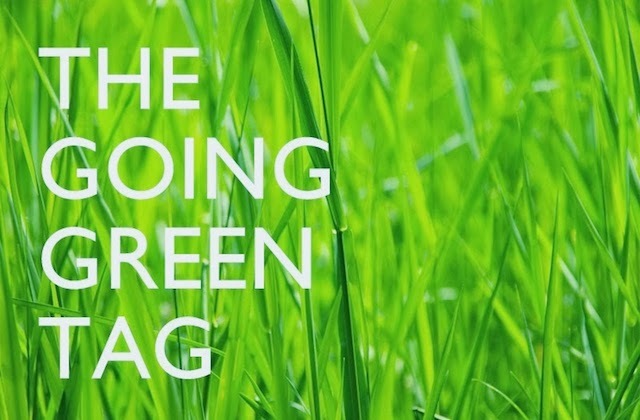 The whole idea behind the tag is to give a little insight into bloggers' experiences of "going green". I've always been aware of harmful chemicals etc. as my Dad has been interested in a lot of alternative matters for as long as I can remember. When I was younger I went through the whole teenage thing, thinking oh he's just being overprotective and I'd be "uncool" or something if I didn't use the same products as everyone else (! ), so I just carried on using the conventional "mainstream" brands. There wasn't nearly as much selection of green products available back then either. That's how it all started though and it was always at the back of my mind. It wasn't until I started doing my own research that I properly decided I didn't want to surround myself with toxic chemicals anymore! I was using natural hand soap for a long time before I even decided to fully switch to natural products! If we're talking about things I consciously decided to switch though I think it was shampoo. The first ingredients I decided to cut out were parabens, closely followed by SLS. I still have a concealer floating around in my makeup bag that isn't natural, but it's only there because I don't want to waste it. It will be gone soon! The thing that took me longest to let go of was my old liquid foundation. I haven't found a natural liquid foundation that I like yet, but I have fallen in love with Inika's Mineral Foundation! Otherwise I didn't really struggle to let go of anything else to be honest! WHAT HAS BEEN YOUR BEST FIND OR CHANGE? One of the best things to come out of my switch to natural products is discovering the whole green beauty blogging community! It's great to have a growing number of like-minded people to chat to and share product recommendations with! I'd say my favourite product discovery would be cleansing balms/oils. I used to only ever remove my makeup with face wipes (cringe!!) but now I can't bear the thought of it and of course my skin has been in much better condition since! WHAT HAS BEEN THE WORST THING ABOUT GOING GREEN? Probably the worst thing for me is not being able to buy all my products at high street stores like Boots (especially makeup for swatching). It's only a trivial thing really! Sometimes it would be a lot more convenient if a greater number of natural brands were available on the high street, but I don't mind ordering the majority of my products online as it usually means I can find the best prices and prevent any impulse buying! WHAT HAS BEEN THE HARDEST TO TRANSITION OR FIND AN ADEQUATE REPLACEMENT OF? Honestly I haven't found it too difficult to replace my old products on the whole. I was dubious about natural mascaras for a while, but discovering Jane Iredale's PureLash Extender & Conditioner (review here) fixed that issue! I mentioned above that I haven't found a natural liquid foundation that I like yet. The ones I've tried have either been too little coverage or had too much of an overpowering scent, so if you have any recommendations for me please let me know! I wrote a post called 'Tips for "Going Green"' a few months ago where I talk about my general tips if you're thinking of starting the transition to natural products yourself. I'll also be expanding on that initial post with a series of more specific tips and advice in the coming weeks so stay tuned for that! So hopefully this gave you some insight into my experience of switching to green/natural products! I know most of the green beauty bloggers have already done this tag, but if you haven't yet... I tag you! I've always considered using a few more natural products which is why your blog is so helpful :) I'm looking forward to more tips. Great post! It's interesting to see that many were influenced by family members who were into all the green stuff, that's so cool! You should see me secretly chucking a lot of the stuff in my parents bathroom and putting better stuff in its place, lol! Totally agree about Jane Iredales primer as well. Okay I need to try the Jane Iredale mascara, it sounds amazing! I don't like wearing mascara as I feel like it ruins my lashes but I've been hesitant to purchase a natural one as I have short and limp lashes but I have to start somewhere! lovely post Ria, just like you i had a green conscious family anyway growing up (live in the countryside of the cotswolds, have chickens, grow our own fruit/veg, have solar panels ….you get the drift) so it was always there for me, but it was doing my own research that gave the final push! And right there with you on the liquid foundation, thats the one i talked about in my video but i've found it a good thing in the end as its made me use less coverage and be more accepting and comfortable with less makeup and my more natural look. Great post Ria! I really enjoyed reading your answers. I would highly recommend the Living Nature Foundation, its really runny but it has a medium-full coverage and still looks really natural and glowy. I really enjoy the whole green blogging community too :) I go through my BlogLovin posts and get rid of all the non-green ones most of the time and just go straight to my 'natural' section haha!